Herts and Souls: abroad in Hertfordshire – MostlyAboutBeer……..
Watford has provoked fear in me for some time because I’ve usually driven in and its road system was designed by Hieronymus Bosch. Circling the town centre, you build momentum through centrifugal force and are either flung from the circuit into deep Hertfordshire or brought in by its gravitational pull. In fourth gear, you realise you need to cross four lanes of agitated motorists in the space of twenty metres. You exit like a dart to breach a chicaned car park entrance. I’d recommend drinking Red Bull before attempting it – in fact, the traffic could be sponsored by it. I didn’t need to worry about that this time though, as I got the train that shuttles between St Albans and Watford Junction which is a genuine delight. It trundles back and forth along a route of just six stops and takes but sixteen minutes. Each time it sets off after a station, a recording of a “ding ding!” is played. I thought I could hear Ringo Starr’s voice narrating. I was commuting to Watford to visit a unique local hero: Pope’s Yard Brewery – this way please ladies and gentlemen. Considering their almost walking distance proximity, the difference between St Albans and Watford is striking. St Albans is a cathedral city of strict masonry, building discipline and conservation areas but Watford feels very different. On the walk into town, it veers off in every architectural idiom at once. The office buildings at the top of Clarendon Road look like the round-cornered and smoked glass futurism of the 1980s and 1990s. The Victorian era Beech Grove Baptist Church boasts its ship-like hull. Then there’s the stocky frontage of the Palace Theatre, Edwardian in age. Deeper in, St Mary’s Church roughly dating from the 1200s squats awkwardly among the multi-storey car parks. There is a tangible pride here too. 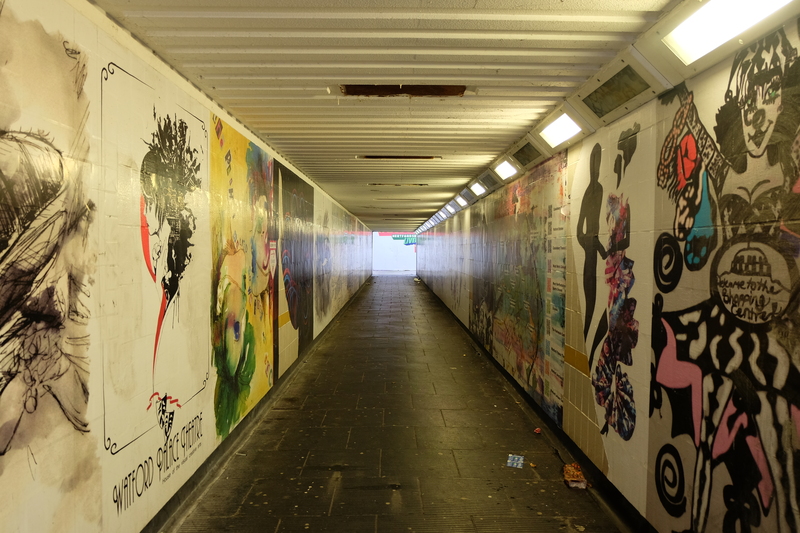 It’s seen it in the murals on the walls along the subways that give pedestrians safe passage into the town’s heart. 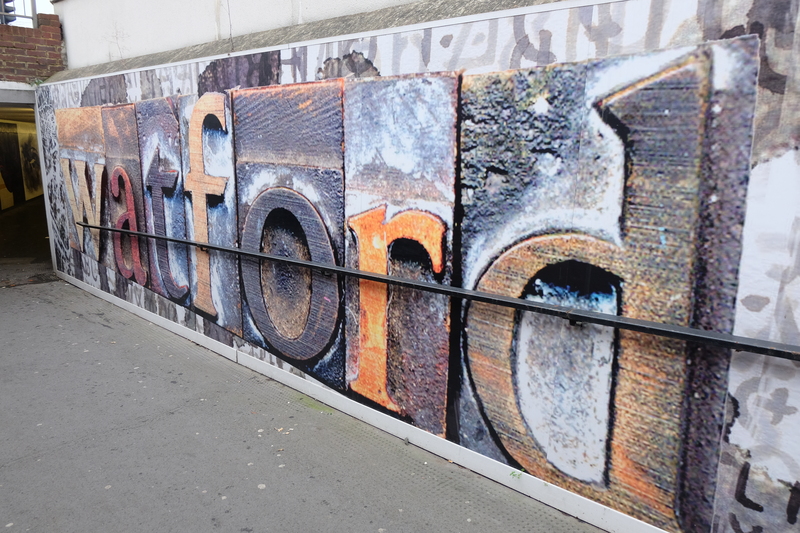 Watford is written in big colourful letters and illustrated in spray paint pictures. The market here is an institution that goes back 900 years and still dominates. 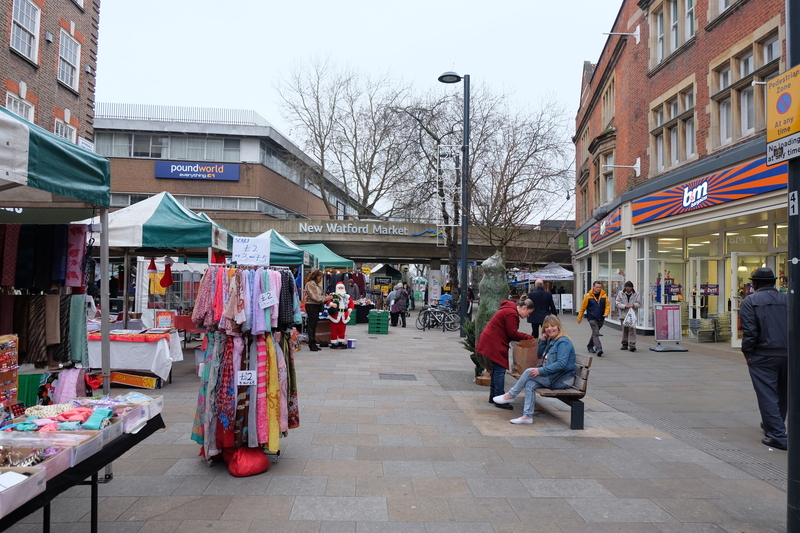 Part of it has been repackaged into a structure made from shipping containers and renamed New Watford Market. The town centre is a bric a brac of chronology and style. It seems both up-and-coming and run down. Gentrification sits shoulder to shoulder with destitution. B&M Bargains neighbours Pret a Manger. But there’s a creative energy here that St Albans is too prudish to acquire. St Albans has too much rectitude. Trashiness – a quality Watford has, comes with a kind of hunger for new blood. St Albans practices self-deprivation in this respect – its city centre looks like the browning photographs of itself from the nineteenth century and will be just as recognisable centuries from now. Watford is a bargain bin of civic projects. It’s alive. St Albans is a tucked-in shirt, cobbled, IT manager-y, Waitrose-y, Jack Wills-y. You just know its pretty streets are heaving with conservation orders and neighbourhood associations that do mulled wine evenings – and they are! Whereas Watford has the freedom to keep redefining itself. There’s an awkwardness to Watford too, though. When said aloud, it even sounds like it’s annoyed. The town’s chaotic but through some cosmic fairness, it’s just as difficult to negotiate through it by car as it is on foot. It’s like the town was planned to make life harder for both modes of travel without putting bias on either. Maybe the planners just got a fantastic deal on concrete. And another thing, why does everybody cycle on the pavement here? I keep almost getting mown down. Perhaps what tops it all is the brutalist concrete flyover careering straight over the main drag – Exchange Road built in 1972. That carriageway needs to stay because one day soon when 1970s brutalism isn’t the recent past but the sepia history, that structure will be as symbolic for Watford as the bridge is in Avignon. It will become a listed monument closed to traffic with a public walkway, visitors centre, viewing platforms and a sustainable coffee shop. Watford, the town on a roundabout, will become a UNESCO site. A cold grey version of the Jetsons – vehicles orbiting in rings around the town and even soaring overhead on roads through the air. This was the future as we used to imagine it. Kudos to Watford for trying.